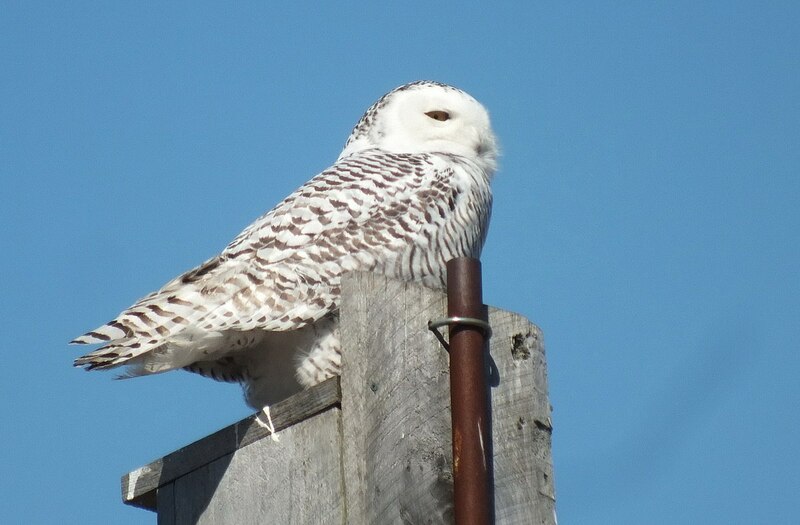 Bob and I are determined, so we decided to once again make a trip to Colonel Samuel Smith Park to try to see the Snowy Owl (Bubo scandiacus) viewed by many birdwatchers. Persistence pays off! 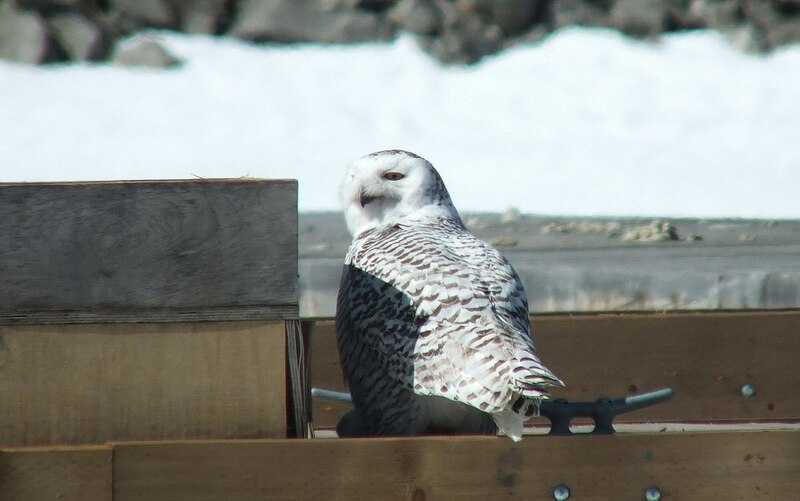 We did locate the Snowy Owl and spent 2 1/2 hours recording its movements about the harbour. 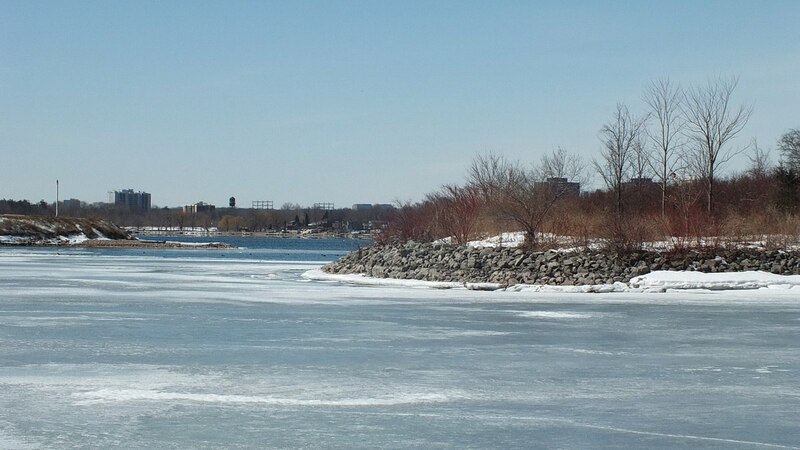 Colonel Samuel Smith Park is located in Etobicoke along a section of Lake Ontario’s wooded shoreline. 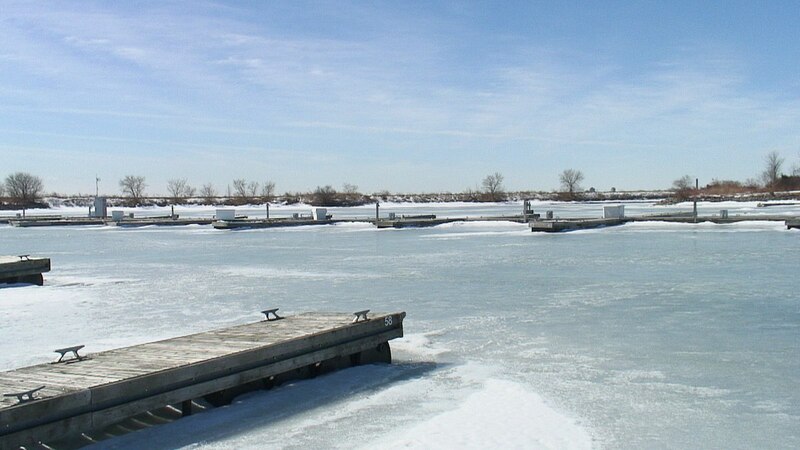 A man-made peninsula extends out into Lake Ontario, and being built in a wide arc that almost wraps around to touch the shoreline again, it has resulted in a safe harbour that is now home to a yacht club. 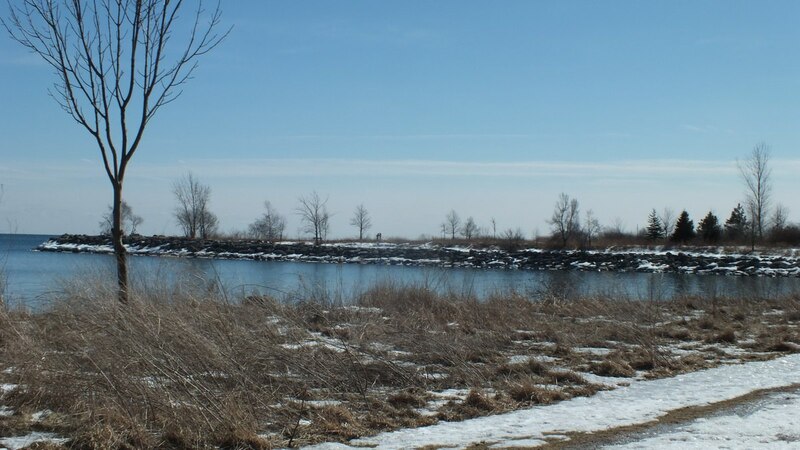 The peninsula is crisscrossed with a series of walking trails that provide access to the Lake Ontario waterfront. 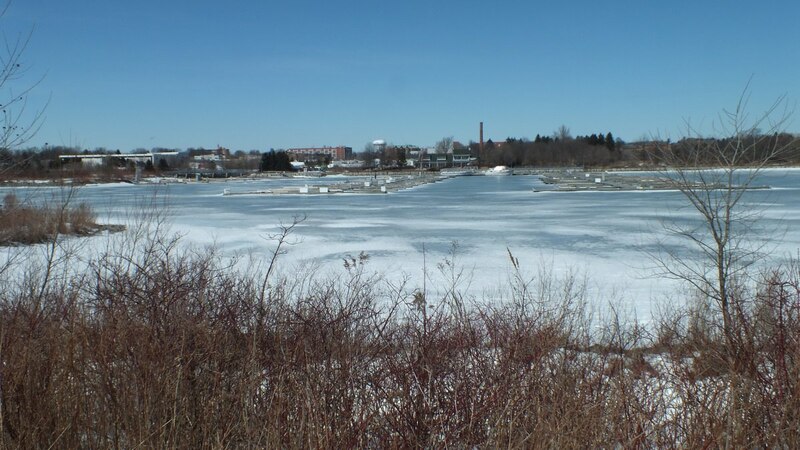 It is from that peninsula, which is naturalized with grasses, small trees and shrubs, that this photo was taken, looking back towards the docks of the yacht club. When first we arrived at the Park, Bob and I headed straight to the spot where others had seen the Snowy Owl, but the Owl was nowhere to be seen. Given the number of people and dogs frequenting the Park by midday, it was no surprise. 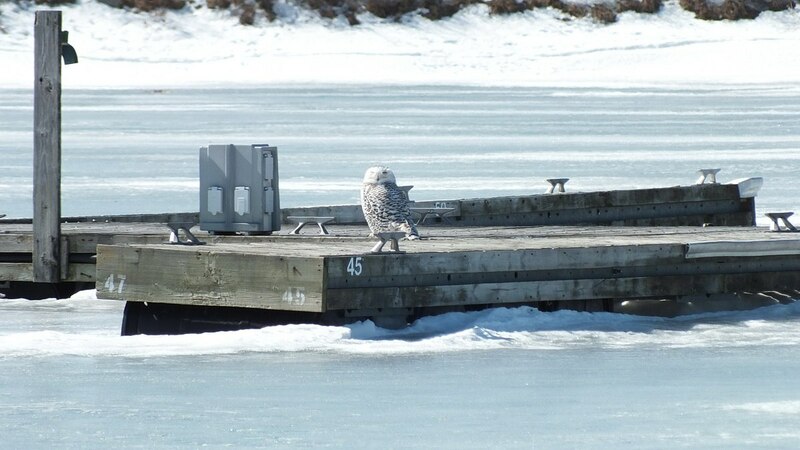 With quiet precision, Bob scanned the docks of the marina using his powerful binoculars and finally managed to pick out the diminutive white form of the Owl out near the middle of the wharfs. At the time, I was busy scanning the low brush and cobblestone beach on the Lake side of the peninsula, so Bob gave a hearty call to get my attention. Even as I hastened towards him, other photographers were rushing with their tripods and cameras…but in the opposite direction. 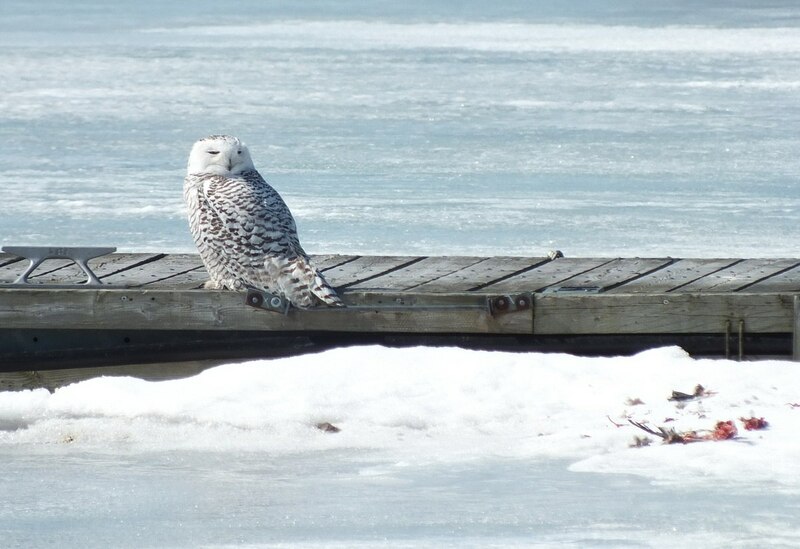 With Bob’s assistance, I was able to locate the Snowy Owl , and then we progressed cautiously from the shore of the harbour out onto the ice, making our way slowly in the direction of the jetties. I was a bit tentative, but knowing how prolonged the subzero temperatures had lingered over Ontario this winter, we both felt confident in the thickness of ice. After all, most of the Great Lakes had frozen over completely. 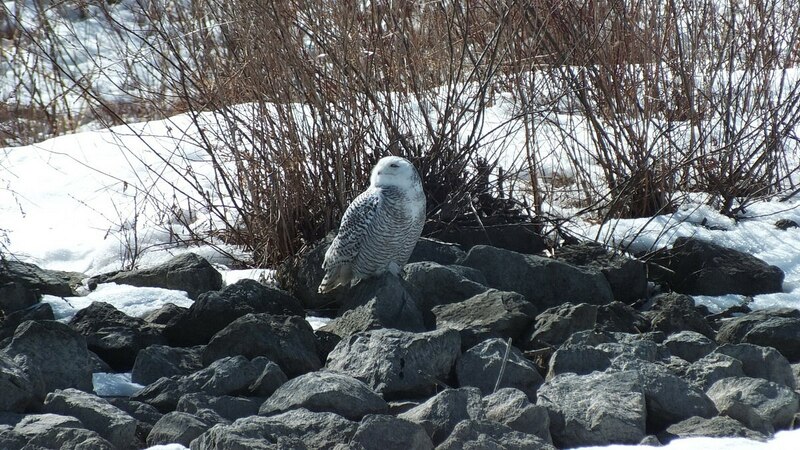 Every so often, we would pause and snap some photos of the Snowy Owl, which seemed to be enjoying the peace and quiet of its location out in the middle of the bay. 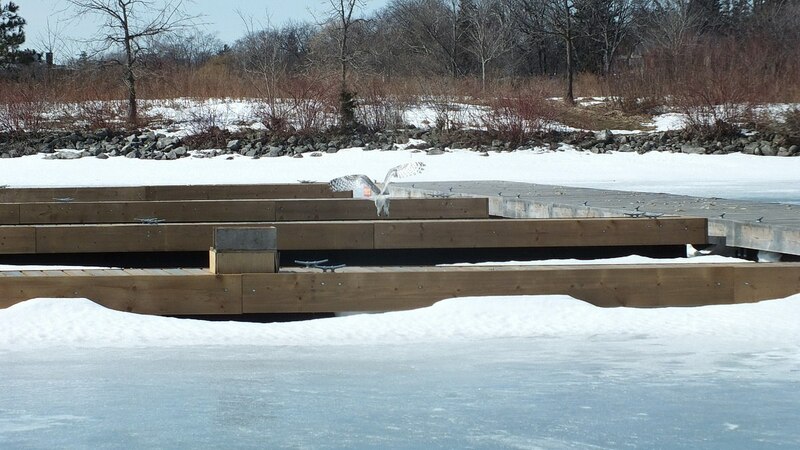 That is, until some chatty people figured out that the Owl was on the dock and came noisily towards it. 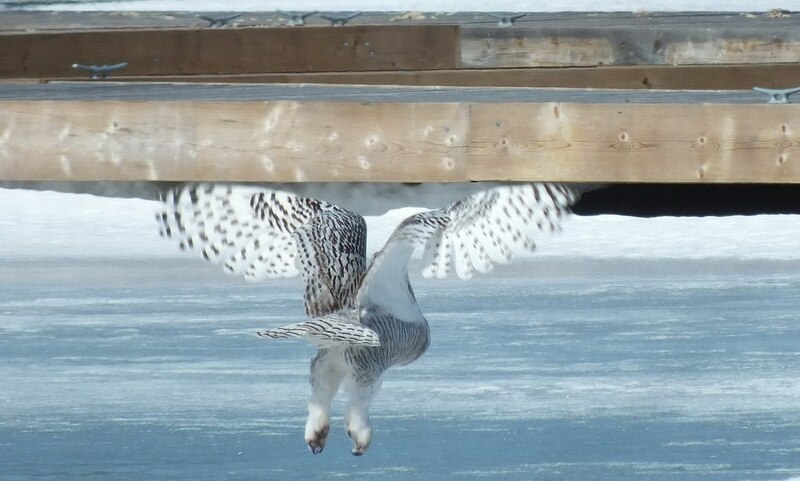 The Snowy Owl promptly took flight over a series of piers and headed across the frozen harbour towards the peninsula. Because the trails were frozen masses of bumpy, chunky ice, fewer people than usual were inclined to hike on the windswept point, and the height of the headland provided the Owl good protection from the strong winds as well as a good view of the bay. 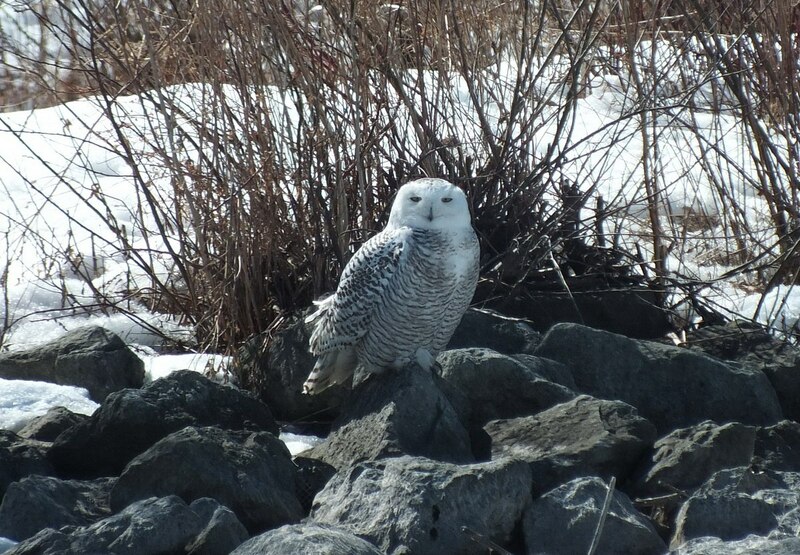 Over the past couple of months, a Snowy Owl has been sighted regularly at Colonel Samuel Smith Park, and with good reason. The quiet coves of Lake Ontario on the windward side of the peninsula had remained unfrozen, and a plethora of waterfowl thronged there in their quest for open water in which to feed. 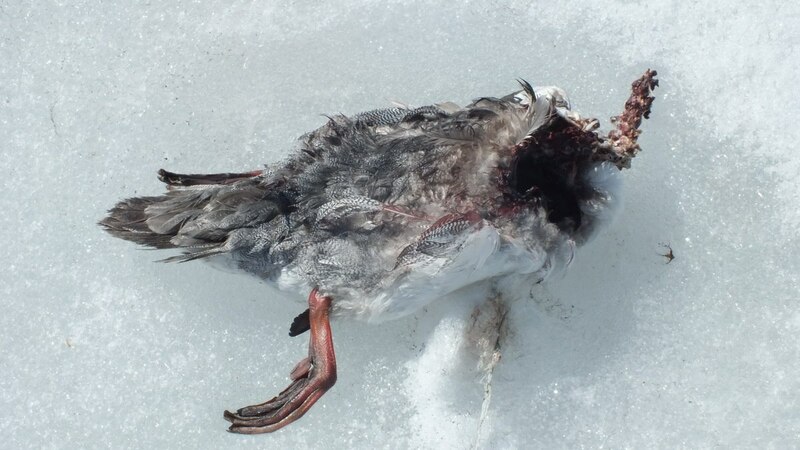 Scattered across the frozen bay was evidence of the Snowy Owl’s past eating habits. Bob and I came across multiple body parts from a variety of ducks that had been consumed. 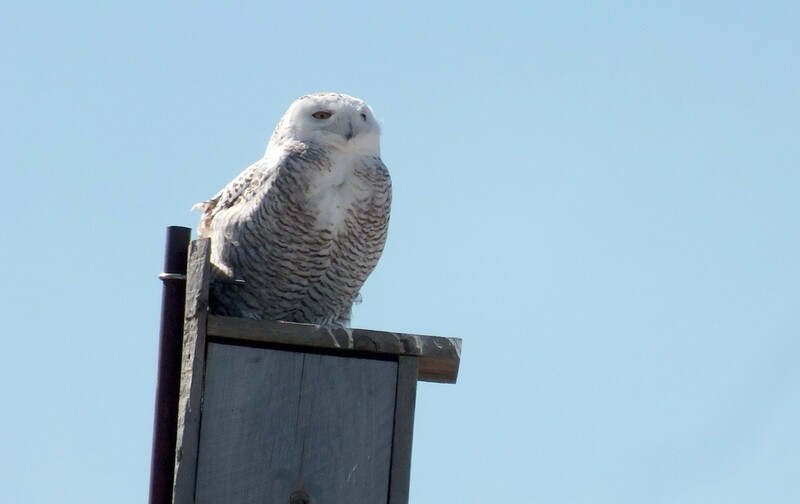 The Snowy Owl kept a keen watch on all things moving, including ourselves, and unfortunately, two large dogs came bounding over the crest of the headland with their owners in tow. 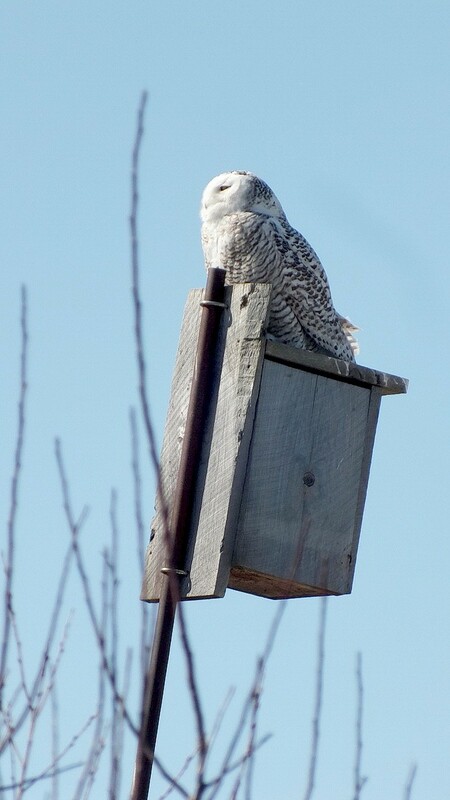 They commanded the full attention of the Snowy Owl. 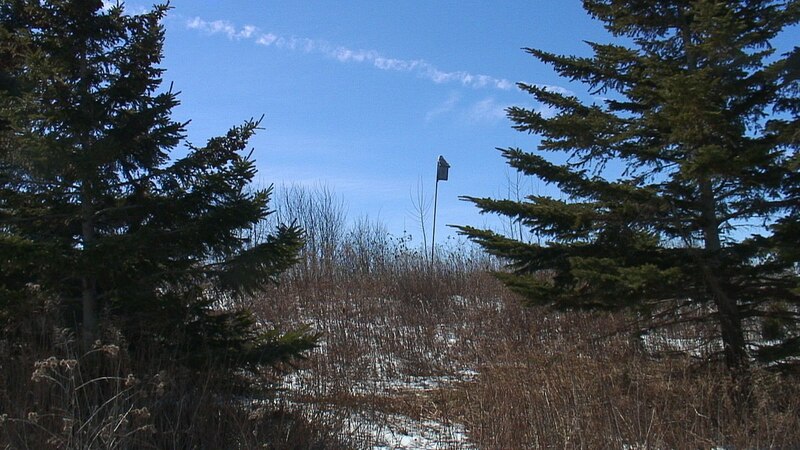 where it zeroed in an a small ridge of snow on the ice’s surface. 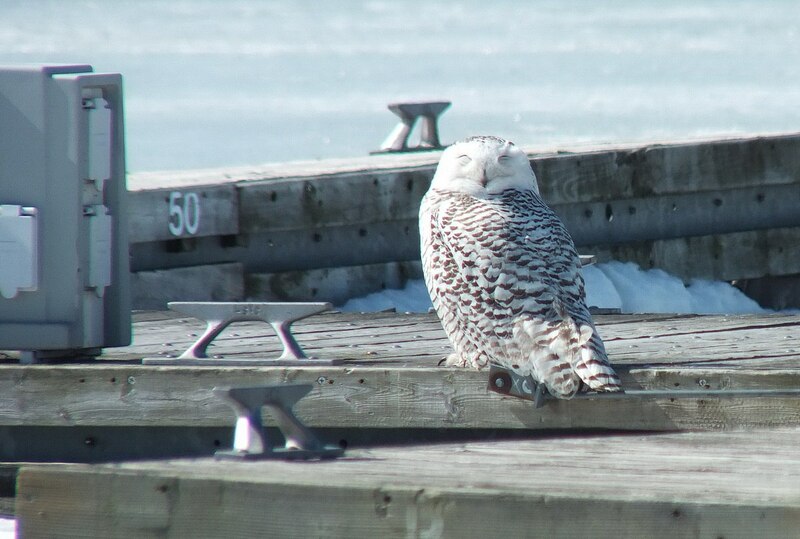 Perhaps because of its exposed position, or simply because it was seeking a better “hiding” place, the Snowy Owl then flipped up onto a nearby wooden jetty. 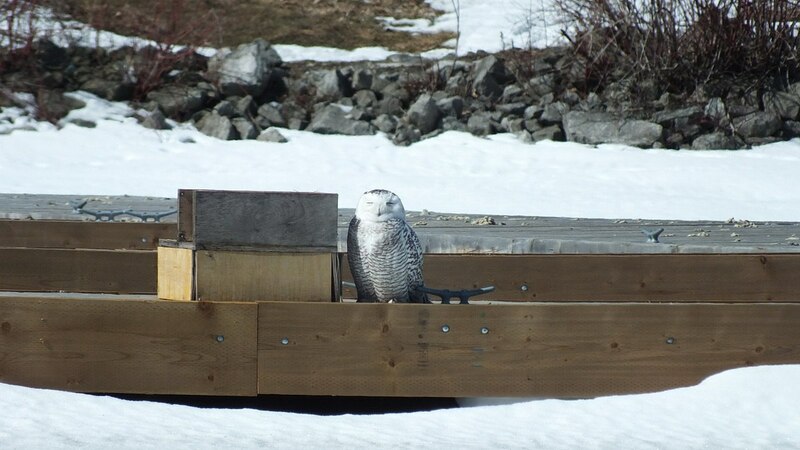 The wooden upright secured to the dock afforded protection from the wind, and there in its shadow, the Snowy Owl was undetectable from several directions. As we and other photographers looked on, the Owl relaxed and began preening its feathers. 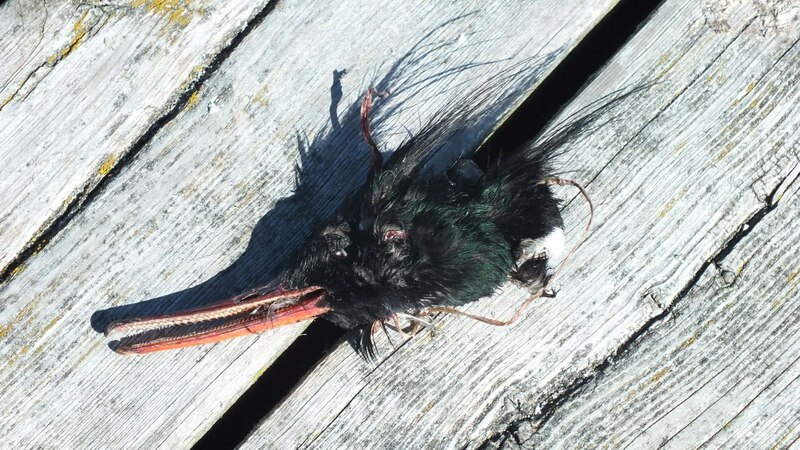 The leftovers from the Snowy Owl’s catches, such as this Merganser’s head, littered the quay. 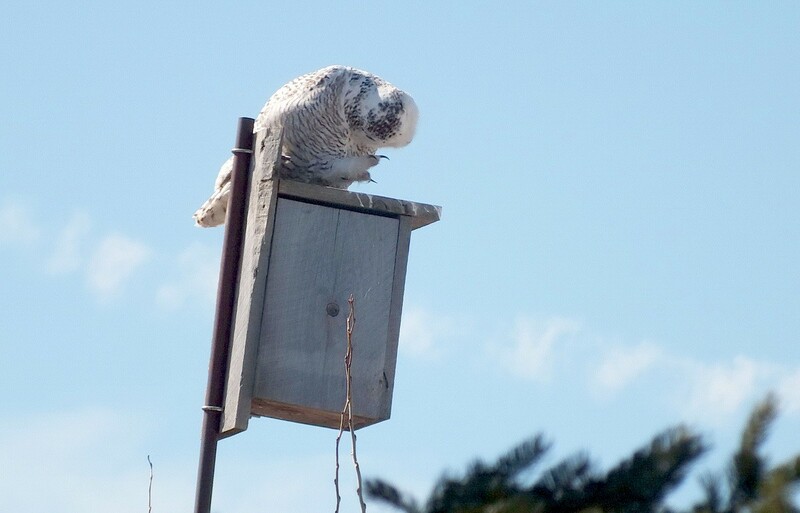 and while we were taking in the scenery, the Snowy Owl lifted off and glided through the air to the relative privacy of the peninsula and a perch atop a weathered birdhouse. Quite the drama unfolded. 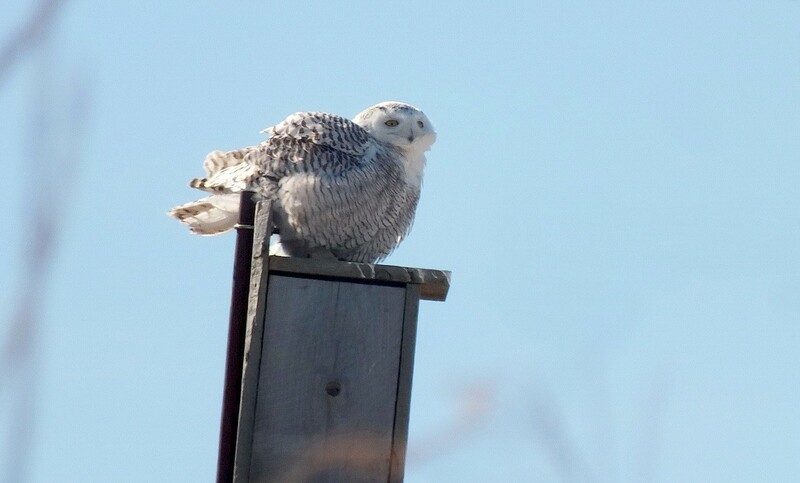 The Snowy Owl’s presence had not gone undetected and had obviously ruffled some feathers. 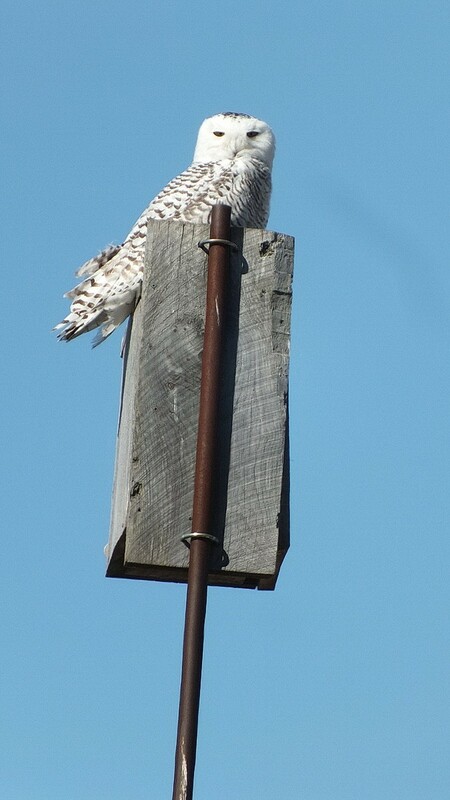 The Owl was being assailed by two Crows and a Red-tailed Hawk. They were dive-bombing the Owl, and the Hawk made menacing passes overhead. The Hawk flew in close to the Owl on numerous occasions, twice landed in a nearby deciduous tree, and launched from there to repeatedly intimidate the Owl. The Owl, in all its wisdom, puffed up its plumage to make itself appear much larger and to therefore convince the Hawk that it was not desirable prey. 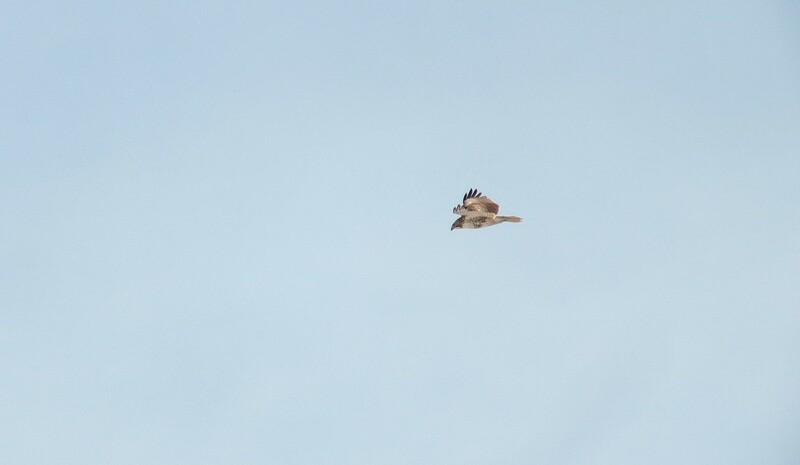 The Owl’s charade must have worked because, in the end, the Red-tailed Hawk left the immediate area. The Owl turned its back on the retreating Hawk and faced the sun. We were thrilled that the Snowy Owl had given us so many varied locations for picture-taking, and unlike the two previous times when we photographed members of this species, we finally were rewarded with excellent light. The sky may have been blue and the sun bright, but it was still a very cold day. 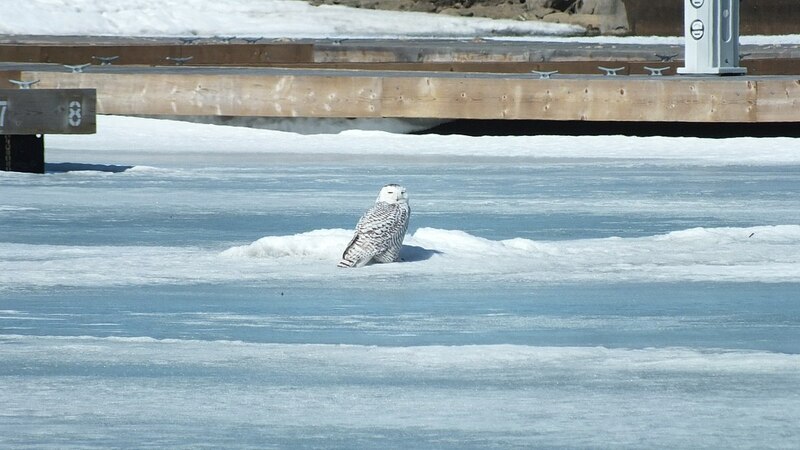 Perhaps that is why the Snowy Owl is still lingering here in Southern Ontario. It won’t be much longer before it heads back to its breeding grounds in the Arctic.